The verdict was pronounced by Special CBI Judge O P Saini citing lack of evidence against former telecom minister A Raja, Rajya Sabha MP and DMK member Kanimozhi and others. On December 21, 2017, a special CBI court in New Delhi acquitted all the accused in the 2G Spectrum scam case. 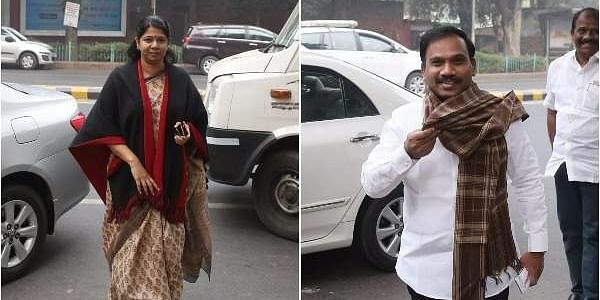 The verdict was pronounced by Special CBI Judge O P Saini citing lack of evidence against former telecom minister A Raja, Rajya Sabha MP and DMK member Kanimozhi and others involved in the case. The verdict comes on a day when RK Nagar constituency is conducting its bypolls. The 2G spectrum scam rocked the UPA government during it's second tenure, under former Prime Minister Manmohan Singh. It has been seven years since a report by the Comptroller and Auditor General (CAG) led by Vinod Rai rocked the political landscape of India. The explosive report on the 2G scam left the then UPA government in tatters and eventually led to its downfall. The Union Government of that time is accused OF undercharging mobile telephone companies for frequency allocation licenses, which they used to create 2G spectrum subscriptions for cell phones. India is divided into 22 telecommunications zones, with 281 zonal licenses. In 2008, 122 new second-generation 2G Unified Access Service (UAS) licenses were granted to telecom companies on a first-come, first-served basis at the 2001 price. According to the CBI charge sheet, several laws were violated and bribes were paid to favour certain firms in granting 2G spectrum licenses. According to a CAG audit, licenses were granted to ineligible corporations, those with no experience in the telecom sector (such as Unitech and Swan Telecom) and those who had concealed relevant information. Although former Prime Minister Manmohan Singh advised Raja to allot 2G spectrum transparently and revise the license fee in a November 2007 letter, it is said that Raja rejected many of Singh's recommendations. Allegation: A joint investigative report by the CBI and the Income Tax Department alleged that Raja may have received a Rs 30 billion (US$470 million) bribe for moving the cut-off date for spectrum applications forward. A CBI charge sheet alleged that Raja conspired with the accused and arbitrarily refined the first-come, first-served policy to ensure that Swan and Unitech received licences.Instead of auctioning 2G spectrum, he sold it at the 2001 rate. Charges: Criminal breach of trust by a public servant (section 409), criminal conspiracy (Section 120-B), cheating (Section 420) and forgery (Sections 468 and 471); booked under the Prevention of Corruption Act for accepting illegal gratification. Allegation: According to the CBI charge sheet, Kanimozhi owns 20 percent of family-owned Kalaignar TV; her stepmother, Dayalu Ammal, owns 60 percent of the channel. The CBI alleges that Kanimozhi was the "active brain" behind the channel and conspired with Raja to coerce DB Realty cofounder Shahid Balwa to funnel Rs 2 billion (US$31 million) to Kalaignar TV. Kanimozhi was in regular contact with Raja about the launch of Kalaignar TV. Raja advanced the channel's cause, facilitating its registration with the Ministry of Information and Broadcasting and adding it to DTH operator TATA Sky's lineup. Charges: Criminal conspiracy to cause criminal breach of trust by a public servant and criminal conspiracy (Section 120-B), cheating (Section 420) and forgery (Sections 468 and 471), and booked under the Prevention of Corruption Act. May: A Raja becomes Telecom Minister. August: Allotment of the 2G spectrum and Universal Access Service (UAS) licences by the Department of Telecommunications (DoT) begins. November: In a letter to the DoT, the Finance Ministry raises procedural concerns. Its demand for a review is rejected. May: A telecom-watchdog NGO files a complaint with the Central Vigilance Commission (CVC) on illegalities in spectrum allocation to Loop Telecom. 21 October: The CBI registers a case, filing a First Information Report against unknown officers of the DoT and unknown private persons and companies under provisions of the Indian Penal Code and the Prevention of Corruption Act. 22 October: The Directorate General of Income Tax Investigation raids DoT offices. 16 November: The CBI investigates a wiretapped conversation by corporate lobbyist Nira Radia to learn the involvement of middlemen in the grant of spectrum to telecom companies, seeking information from the Directorate General of Income Tax Investigation about Radia and her company. 6 May: Telephone conversation between Raja and Niira Radia, recorded by the Directorate General of Income Tax Investigation, made public. The Centre for Public Interest Litigation petitions the Delhi High Court for a special investigation of the scam. 15 December: Janata Party chief Subramanian Swamy petitions a Delhi court for his inclusion as a public prosecutor, saying Raja favoured "ineligible" companies Swan Telecom and Unitech Wireless in allocating spectrum. 2 February: Raja, former Telecom Secretary Siddharth Behura and Raja's former personal secretary, R. K. Chandolia, are arrested. 17 February: Raja is sent to Tihar Jail under judicial custody. 29 March: The SC allows the CBI to file its chargesheet on 2 April instead of 31 March. Asif Balwa and Rajeev Agarwal are arrested. April: The CBI files a second chargesheet, and Kanimozhi, Sharad Kumar and Karim Morani are summoned. Kanimozhi and Sharad Kumar appear, requesting bail, and Morani requests an appearance exemption on medical grounds. SC later refuses Kanimozhi's bail request. October: The SC reserves judgment on Swamy's request for a probe of Home Minister Chidambaram's role in the scam. The CBI arrests former telecom minister and DMK leader Dayanidhi Maran and his brother, Kalanithi Maran. 23 April: In a 112-page written statement to the joint parliamentary committee, Raja said that he met with P. Chidambaram and Prime Minister Singh several times from November 2007 to July 2008 to inform them of all 2G-related decisions and Singh agreed with him.